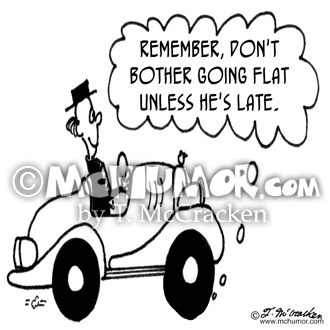 Tire Cartoon 4445: A tire on a car says to another, “Remember, don't bother going flat unless he's late." 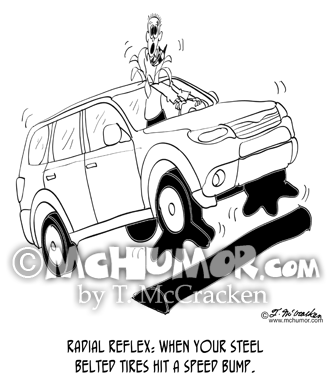 Baby Cartoon 6709: A man and woman with a baby are standing in front of a car with a flat. 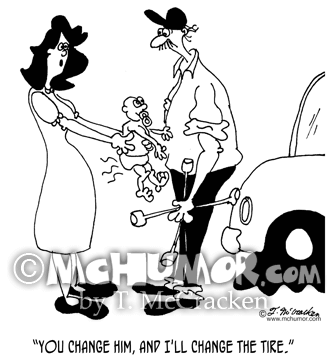 The woman hands the man the baby and says: "You change him, and I'll change the tire." 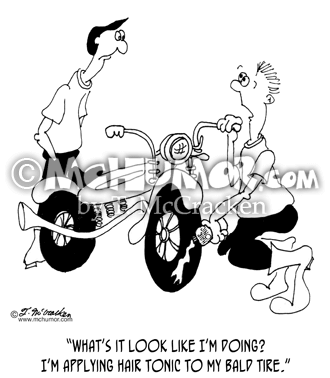 Motorcycle Cartoon 6808: A biker squeezing goop from a bottle onto his tire explains, "What's it look like I'm doing? 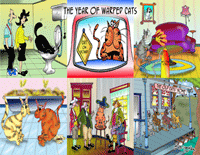 I'm applying hair tonic to my bald tire." 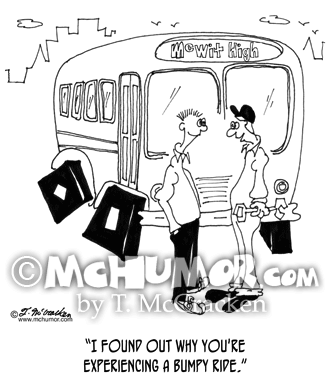 Bus Cartoon 7059: A mechanic says to a driver of a bus with square tires, "I found out why you're experiencing a bumpy ride." 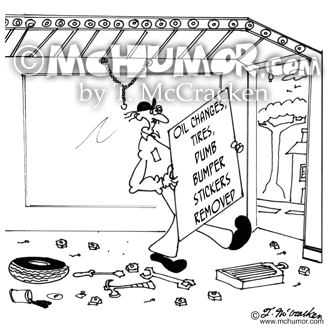 Car Cartoon 5182: A gas station sign, "Tires, Oil Changes, Dumb Bumper Stickers Removed." 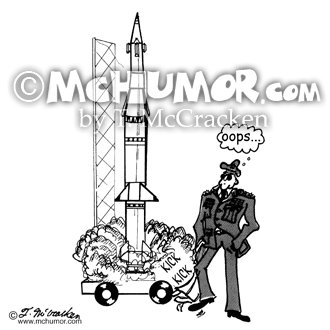 Military Cartoon 2086: When a general kicks the tire on a missile's launch pad's wheel, it goes off and he thinks, "Oooops." 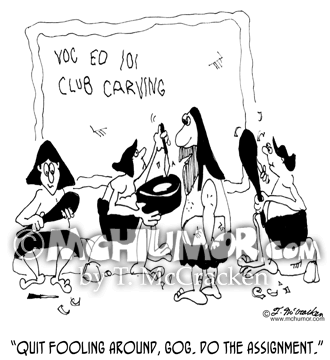 Voc Ed Cartoon 4494: A caveman voc ed teacher to says to a kid carving a wheel as others carve clubs, "Quit fooling around, Gog. 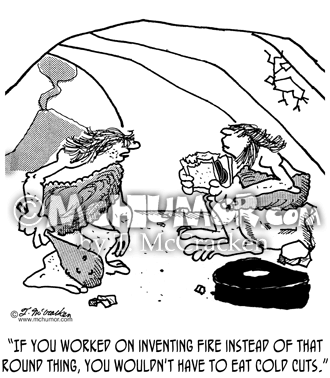 Do the assignment." 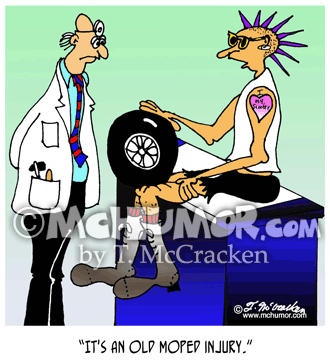 Moped Cartoon 7429: A punk with a wheel protruding from his knee says to a doctor, "It's an old moped injury."